What I look for from a value-priced Bordeaux is a smooth, balanced wine that makes steak sing, chicken celebrate, pork praise and tomato sauces shout “oh that’s SO good”! 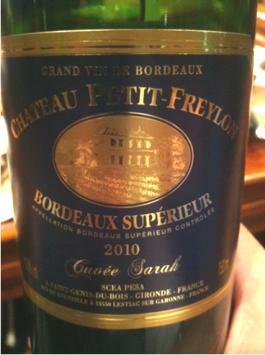 Last year, I tried the 2009 Chateau Petit-Freylon Cuvee Michael and was underwhelmed. So when I paired the 2010 Chateau Petit-Freylon Cuvee Sarah (presumably, she’s related to Michael) with a roasted tri-tip, the food gave me a standing ovation. Unfortunately, it wasn’t for my cooking as much as this surprisingly accommodating Bordeaux with the unassuming price. Costco asks $7.99 for this easy drinking, well-structured Cab-based blend but the 25% Merlot gives the wines some subtlety that allows it to play nicely with a wide variety of foods. It combines a little terroir with a good mouth feel, black cherry overtones and a gentle oak finish resulting in a Goldilocks “not-too-dry-not-too-fruity” harmony. It is just a nice integration of Bordeaux’s best characteristics. Did I mention that it is $7.99? I’ve had more than my fill of $19.99 French blends that are far less food friendly than this sub-$10 Bordeaux. I don’t know Sarah but now I want to meet her, give her a hug and offer thanks for making good French table wine affordable.